Trees or Guardrails - Panhandle “Backlash” Saves Trees. According to a recent article in the Amarillo Globe, it has been four years since “state transportation officials” proposed cutting down both trees in the Texas Panhandle. Okay, that’s a slight exaggeration. There are a few more than two. 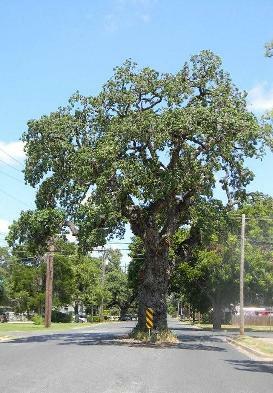 TxDOT managed to count 1,185 trees – that were “encroaching” on Hemphill County highways and proposed to cut every one of them down. In less threatening terms, these trees simply lined highways 60 and 83. One theory at the time was that motorists unaccustomed to seeing trees would fall into a trance and aim their cars at them. The local population opposed the suggestion of removal – and the TxDOT engineer (Howard Holland) is quoted as saying “We're trying to cooperate.” One is reminded of William Macy’s nearly verbatim line from the movie Fargo. Got a hat on? Take your hat off! Enter Judge Steven Vandiver, the plain-talking Hemphill County Judge. A man Will Rogers would’ve loved. Vandiver stated that TxDOT “built miles of guardrail to keep those trees from wandering into the road.” He also suggested: "Why don't we just say, 'people, if you hit a tree, you're stupid?'" The plan to remove the trees and train Panhandlers in the use of chainsaws would’ve cost an estimated $84,000. A bargain when it comes to ruining the landscape. The installation of guardrails (and deflecting pipes over culverts) cost about 4.4 million dollars – using TxDoT’s own figures. While Hollard VS Vandiver sounds like a Dutch lawsuit, the dispute never reached a docket. It was Vox Populi that won the day. Engineer Holland reportedly said that there were three choices: remove the trees, install guardrails or do nothing. May we be so bold to suggest a fourth option? Perhaps District Engineer Holland could borrow TxDOT’s scoring machine than grooves the shoulder of the highway so that when tires run across the scored section it makes a sound guaranteed to wake most nodding drivers (to say nothing of their traveling companions). The sound may even have the unexpected benefit of frightening the trees into abandoning their encroaching ways. The Globe article went on to say that Canadian citizen (and preservationist) Salem Abraham once told his fellow Canadians that TxDOT could be trusted. His neighbors didn’t quite share his optimistic view. Like the little girl who wrote the book report on Penguins, Abraham, who served on the committee that reached the compromise, said he had learned more about guardrails than he thought possible. District Enginner Holland was quoted as saying: "All I've heard is, “I'm glad TxDOT listened to us and left the trees.'" The story, written by reporter / photographer Joe Gamm contains two photographs, one of which shows a memorial cross and an accident damaged tree. The article also has generous supply of comments – overwhelmingly in favor of keeping the trees. That, my friends reveals the real source of the problem – birds. Maybe TxDOT has already formed a committee to look into it. Here’s the link to the Amarillo Globe article: http://www.amarillo.com/stories/080410/new_news1.shtml Tell Joe Gamm he did a good job.